Welcome back to one of my favorite new series on Teal & Lime. 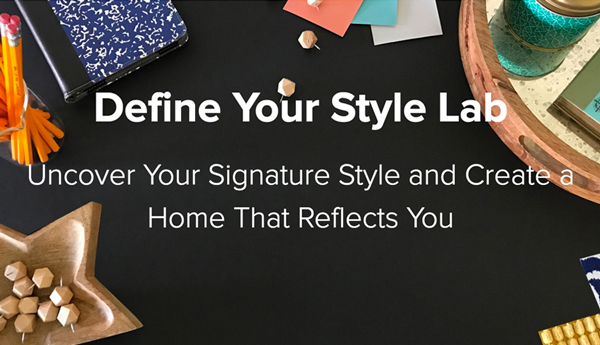 I find inspiration in all kinds of places, but I am mostly inspired by interiors, both residential and commercial. I wanted a more formal way to share some of the things I find inspiring. 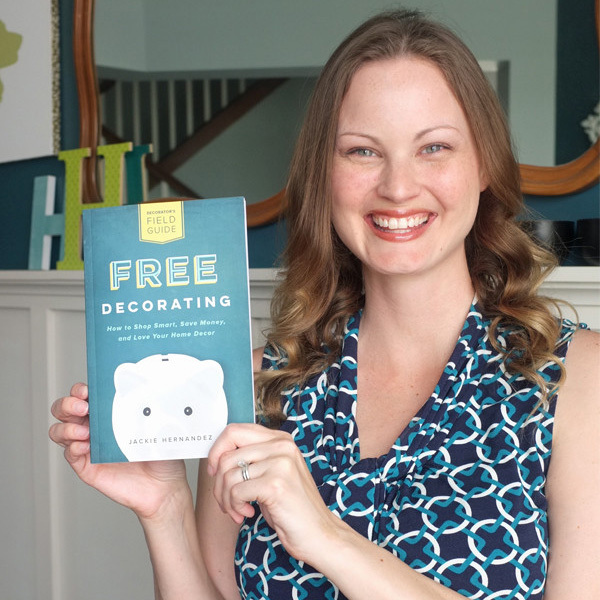 Today’s post isn’t a typical Be Inspired post with interiors I candy, but I hope you will indulge me as I relive one of my favorite days. I hope you’ll find it inspiring. 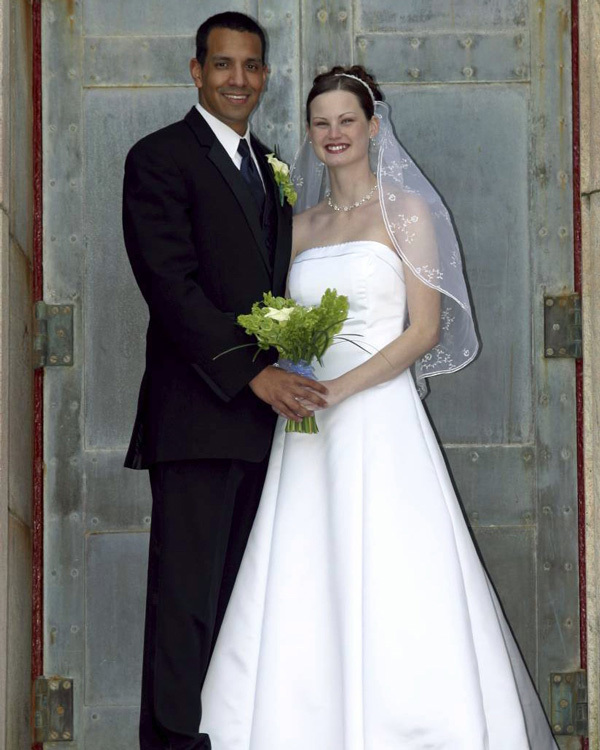 Nine years ago today I married the love of my life! 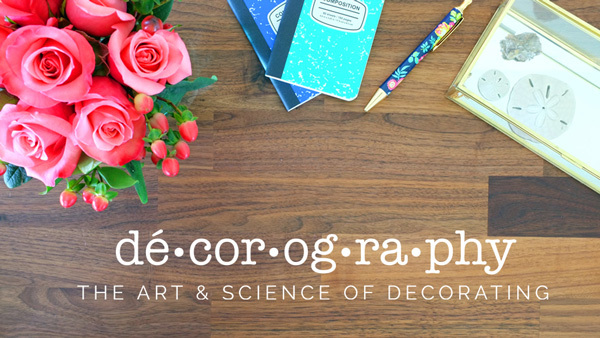 If you ever wondered how deep my love of DIY runs…our wedding story might give you a clue. 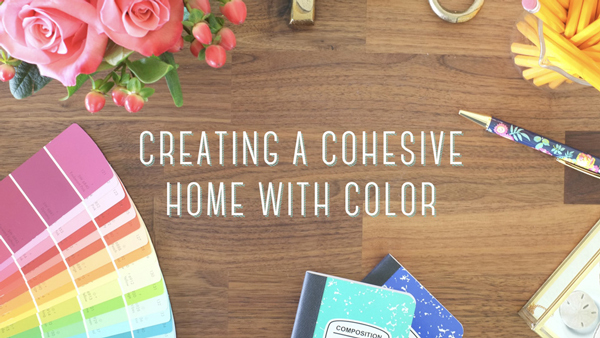 It was a DIY affair from head to toe…literally. I made everything from my wedding dress to my wedding cake. We got engaged (officially) on Dec 1st, and married the following April 2nd. With hardly four months time we pulled together our dream wedding. He actually gave me a promise necklace on a weekend getaway to New Orleans in July, just before he deployed. I wouldn’t see him again until Thanksgiving. While he was away I spent my free time making my wedding dress. My mom worked at Joann Fabrics at the time. She was able to get me an amazing deal on all the satin for my dress. The entire dress cost me less than $100 to make. Nervous to mess up my satin and unsure of my sizing, I made a full replica of the dress bodice out of inexpensive muslin first. Once I got the fit right, I made the satin dress. It was supposed to have a full layer of sheer fabric over top, but I struggled with the tiny rolled seams. I ended up skipping the sheer layer, and just added a band of sheer satin edged ribbon at the top. The dress was completed and tucked away before he came home, and before we were officially engaged. Oh, and I made the veil too from sheer fabric with a flower detail and satin ribbon. 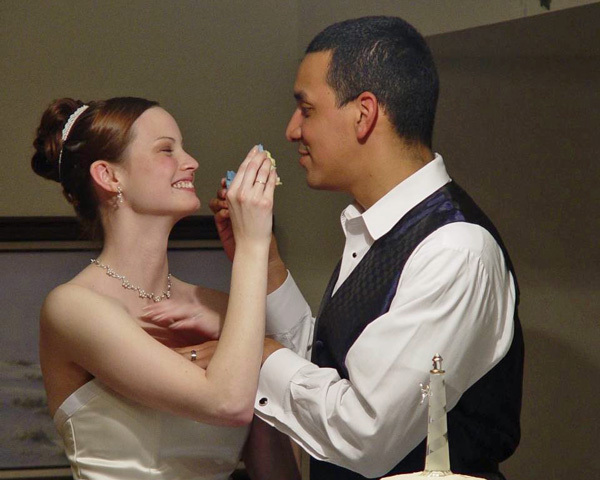 While he was deployed we talked often about our wedding day. Some days it is probably what kept him going. We settled on an April wedding and chose a location. 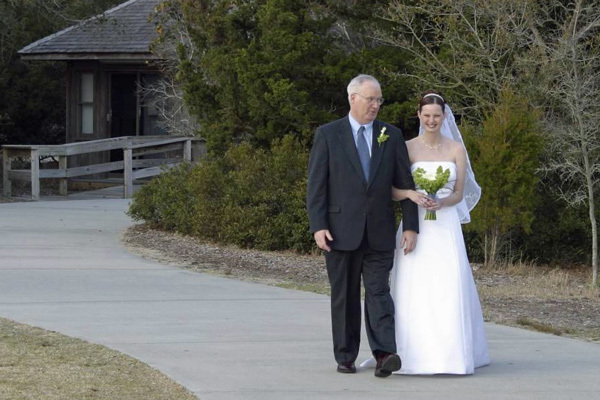 We opted for a destination wedding in the Outerbanks of North Carolina. 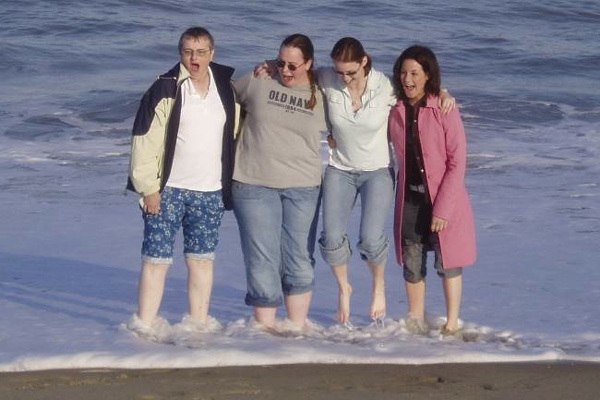 We had vacationed there on our first Valentine’s Day and loved it. 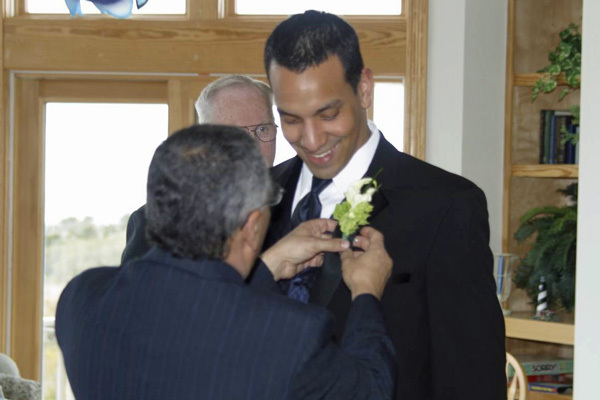 While he was half way across the world in various Middle Eastern countries and I worked nights at an AF base in Virgina, we planned a wedding in North Carolina. Our families would be traveling from Minnesota and Texas. 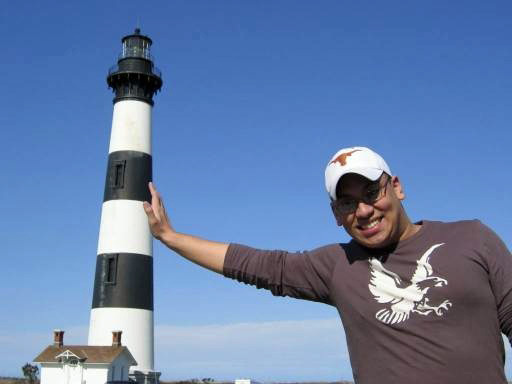 We applied for a park permit to get married in front of the Cape Hatteras lighthouse. 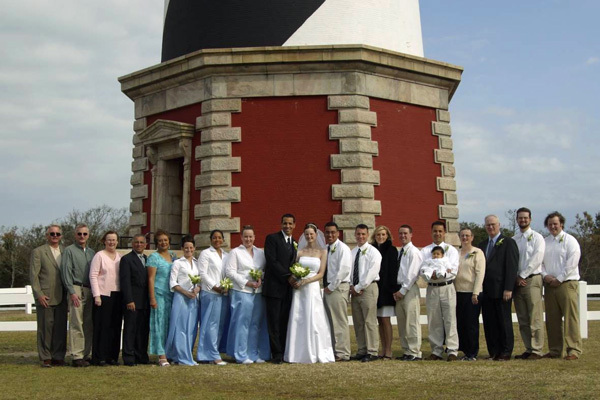 In October that year, the whole area was hit by Hurricane Irene and we feared the lighthouse would be gone. It survived…a good omen. Reverend Leslie Buck-Ferguson performed our ceremony during which she read a poem she wrote comparing the strength of our love and marriage to the strength of the lighthouse as a beacon. 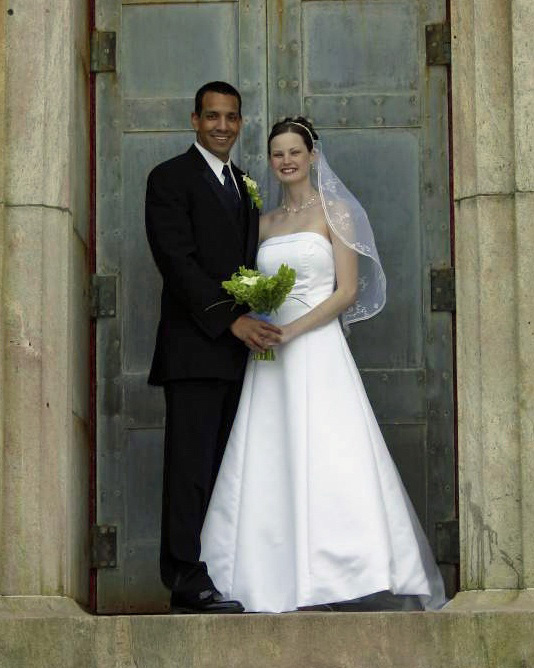 The biggest expense for our wedding was about $1500 to rent a 4 story, 7 bedroom beach house for an entire week. Our immediate families, bridesmaids, and groomsmen and their plus 1s were all invited to spend the week with us in the house. It was like one big family vacation, and an amazing way for our families to get to know each other. The week leading up to the wedding was filled with local sight seeing with our family, the rehearsal, and lots of last minute preparations. My mom made skirts for all the bridesmaids, who brought their own white collared wrap shirts. Mom also hemmed the ring bearers baby tux. 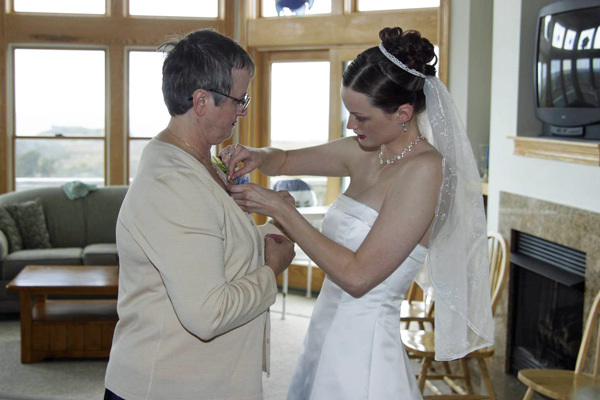 Yep, you guessed it…my mom is the one who taught me to sew and do most other crafty things. The ring bearer was our 7 month old nephew. 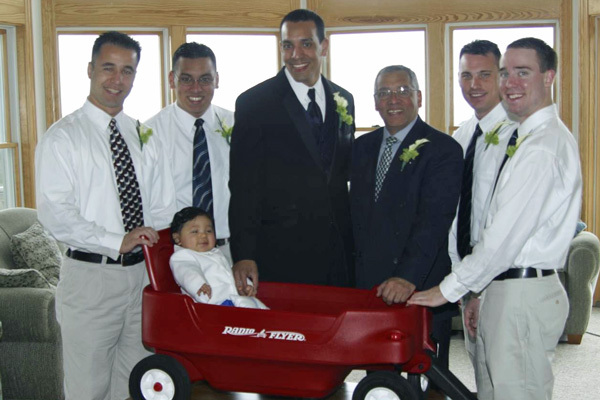 He was too young to walk, so we bought him a red wagon to ride down the aisle in. I am sure we could have found some fancy vintage wagon, but instead opted for a nice durable one as a gift for him to keep. His dad pulled him down the aisle. The day before the wedding, I arranged the bouquets and made the boutonnières. I worked at two flower shops during college and was confident I could pull simple bouquets off. My flowers of choice were white calla lilies and bells of Ireland. I mail-ordered them through a wholesale flower site. This picture has my something old, something new, something borrowed, and something blue. 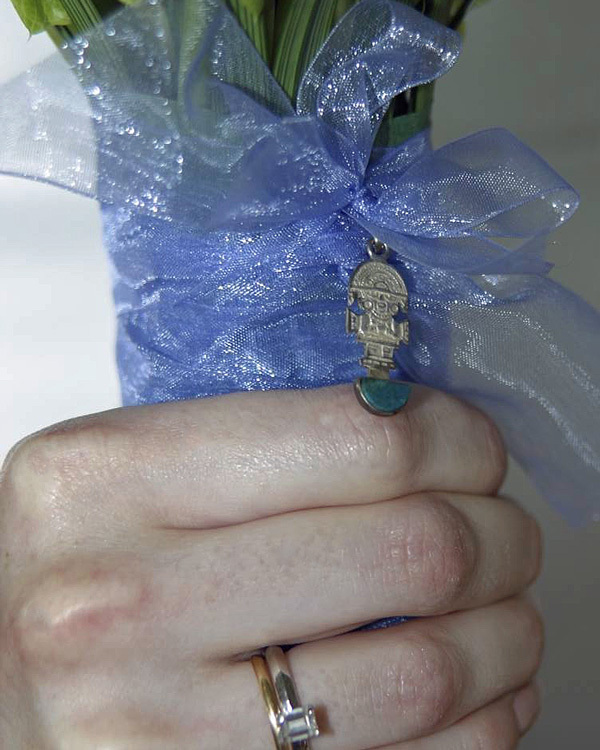 My old was the Tumi (a Peruvian good luck charm) given to me by my MIL tied onto my boquet. The new was my engagement ring. The borrowed was my great Aunt Margie’s gold wedding band (actually worn on my right hand during the ceremony). The blue was the ribbon tied around my bouquet. The day before the wedding, I baked all the layers for my wedding cake. A month or two earlier I tried the Martha Stewart recipe and had a private tasting with my hubby to be. I also made the lemon curd filling. The morning of the wedding, my first order of business was to assemble the cake. Each layer was two sheets of cake with curd in between. My curd didn’t set up right and was a soupy mess. The father of the bride came to the rescue. He ran to the nearest grocery store and talked to the bakers. He came back with everything lemon flavored in the store…lemon pudding, lemon frosting, lemons…you get the idea. The lemon frosting was the perfect no fuss solution. 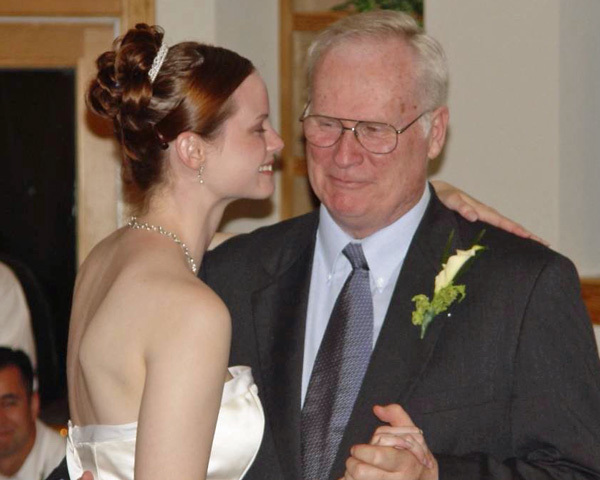 My dad was the hero of the day, as I am sure I told him later during our dance. 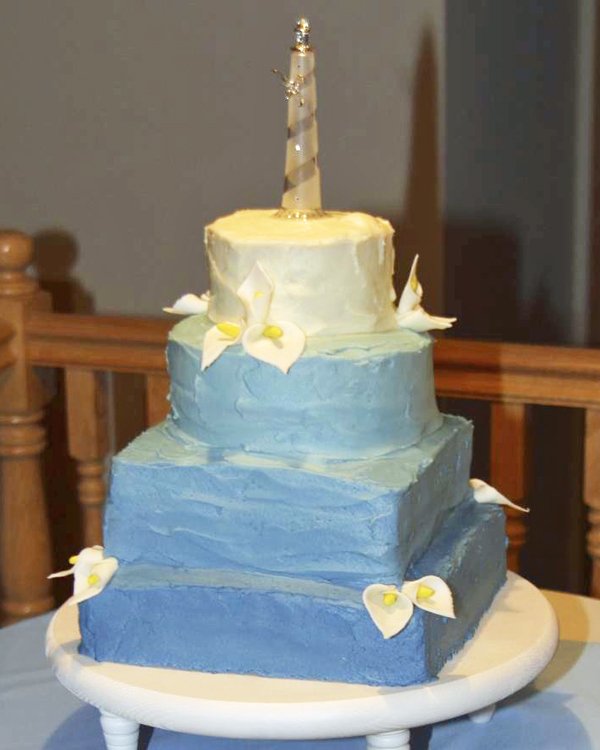 I assembled the cake and frosted each tier in different shades of blue. Yes, I was into ombre way before it was popular like it is now. The cake topper was a glass lighthouse. The cake stand was a DIY project made the week before with a table round and short furniture legs from the home improvement store painted white. 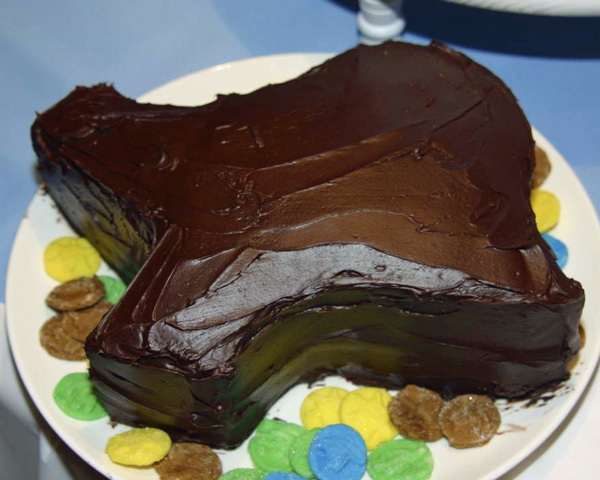 We made the groom’s cake in the shape of Texas with the help of a ceramic pan I found online. We still have it, and use it as a serving dish. After the cakes were ready, it was time for hair and makeup. 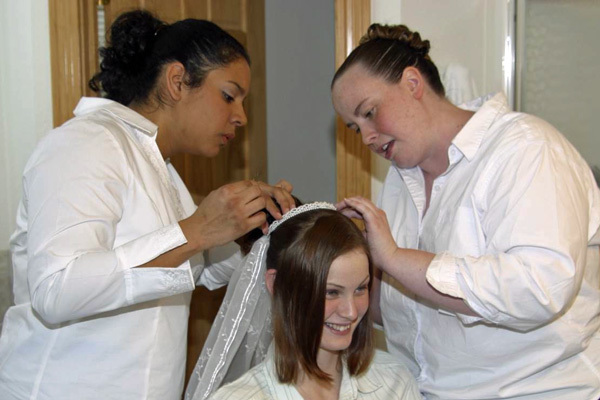 I helped all my bridesmaids (my BFF, sister, and SIL) do there hair first. Then, they did my hair. I told you it was all DIY! It was a good bonding experience and we all looked gorgeous. Because our wedding was at sunset, we took photos before the ceremony. 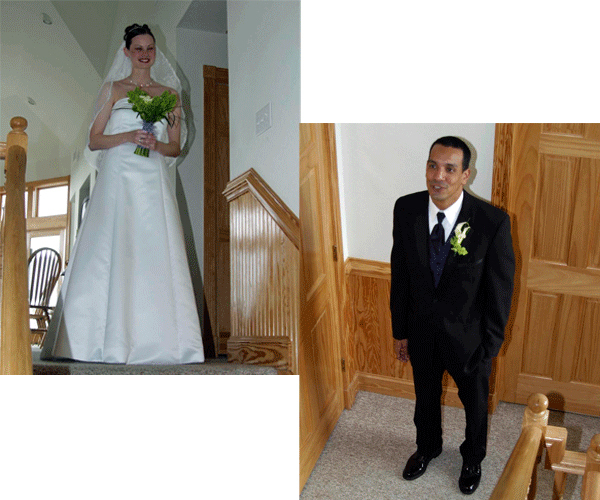 At the beach house, my hubby-to-be waited at the bottom of the stairs for me to appear. All he said was WOW! 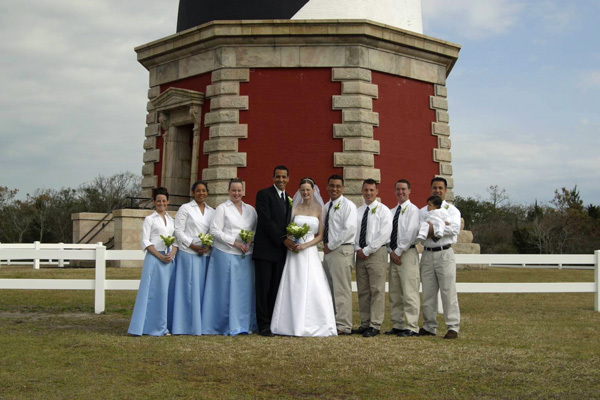 We did a bunch of the formal family and wedding party photos in front of the light house. You can’t tell from the gorgeous blue skies in these pictures, but it was only about 40 degrees that day. I begged everyone to squeeze in close during the pictures to keep me warm. After the posed photos, my groom and I headed down to the beach for a few more shots. 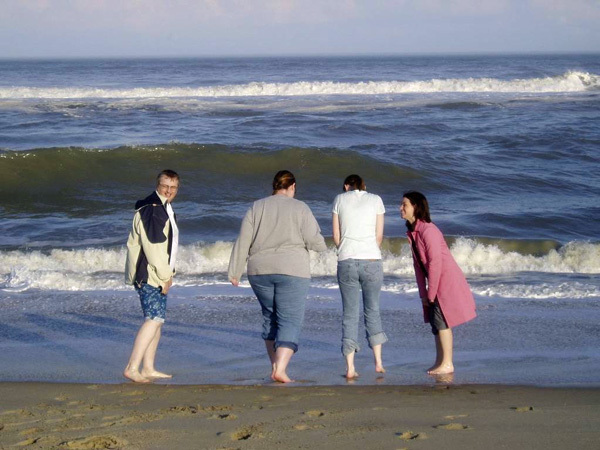 In the one where my hubby is pointing, we were actually watching dolphins swimming just off the shoreline. We hired a friend, and former co-worker, as our photographer. He moonlighted as a wedding photographer. 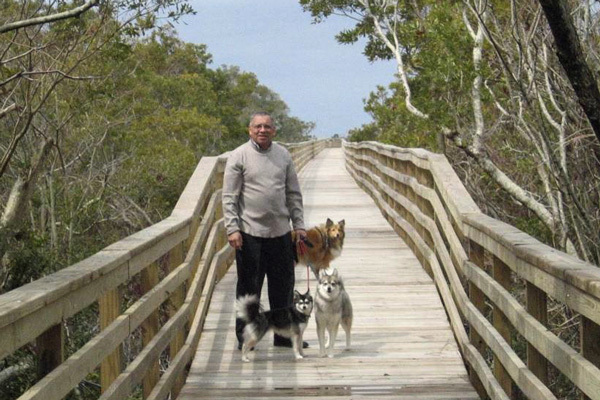 He was still primarily using film, but had started using digital. He offered to do both, and gave us all the digital pictures for free! We also had another friend sing, live without a microphone or backup music, in front of the lighthouse as my dad walked me down the aisle. He sang a beautiful rendition of “I Love the Way You Love Me” by John Michael Montgomery. To thank him we provided a hotel room for him and his wife. We were both active duty military when we got married. We decided not to do a military wedding. 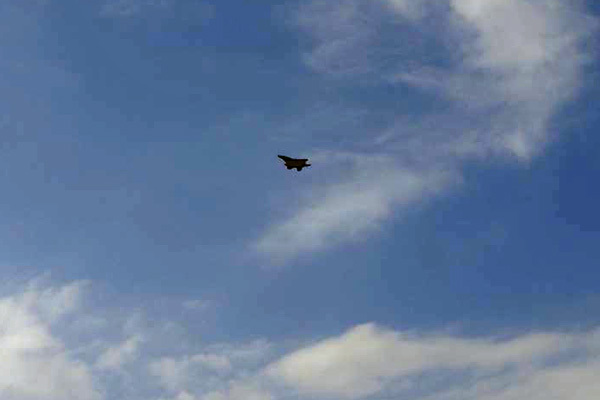 We were pleasantly surprised when jets flew over our ceremony. Some guests wondered if we called in a fly over, but, nope, it was just an awesome coincidence made more likely by the number of air bases on the East Coast. 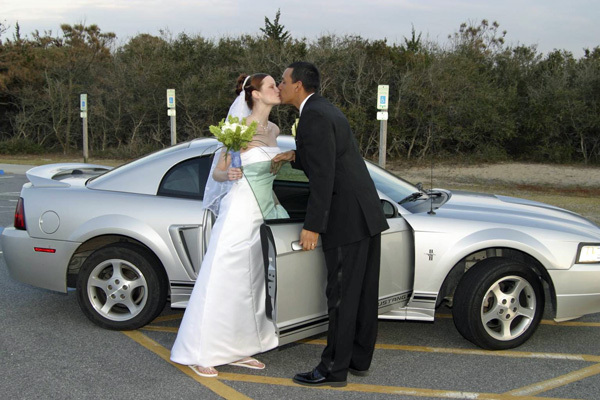 Immediately after the ceremony, the hubby and I snuck off in his Mustang. Meanwhile, our guests headed to the beach house to kick off the reception. We wanted to be fashionably late, so we pulled off at a local pizza joint for a slice before going to the reception. We were still in wedding gown and tux. The patrons were so sweet. One even paid for our pizza and a souvenir t-shirt. It was a sweet memory. At the reception everyone asked where we went, but we kept it a secret for a few days. There were no pictures, but we clearly remember sharing lots of smiles over a few slices of pizza. Along with a “message in the bottle” guest book, we displayed our engagement photo at the reception. 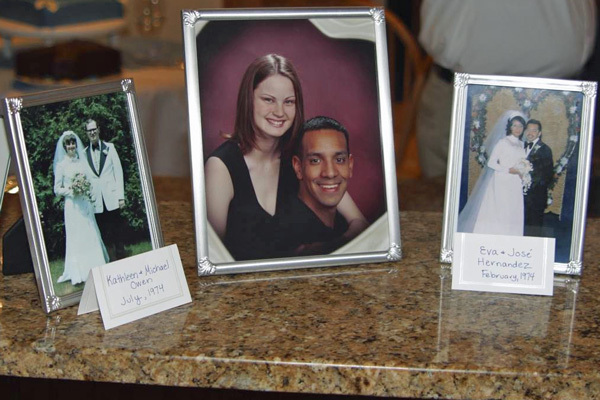 Along side our photo, we displayed both of our parent’s wedding photos. Both of our parents were going to celebrate their 30th wedding anniversaries the year we married. We thought that deserved to be celebrated. It was a walk down memory lane for our parents, and a fun conversation starter for everyone else. Oh, the fashion of the 70’s! Back at the beach house, we snuck into a bedroom so I could do a wardrobe change. My party dress was a short strapless number I bought inexpensively at David’s Bridal. It originally had black trim at the neckline, black straps, and black tulle coming out the bottom hem. Early in the week my mom helped me remove the black and replace it with white. 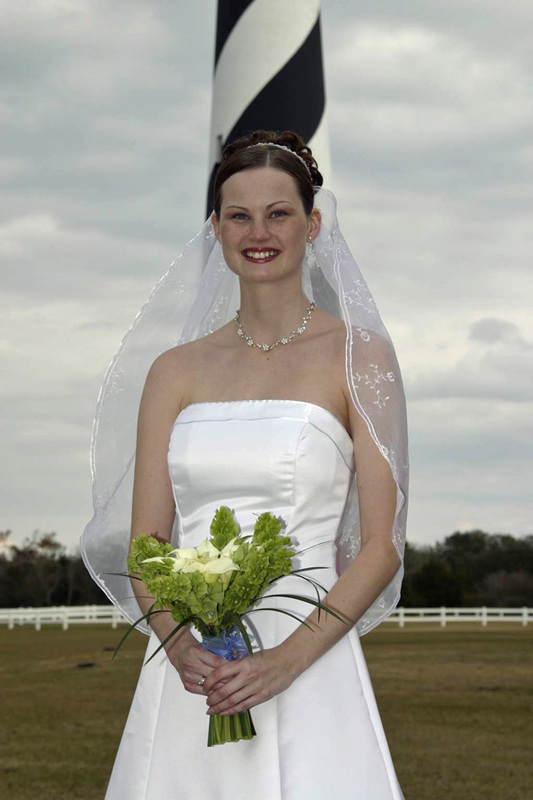 We also made it strapless, although I remember my bridesmaids helping me pin it to my bra with lots of safety pins in the middle of the reception. My girls had my back and there were no wardrobe malfunctions. Yep, the whole night was pretty much one big happy fun love-fest. Complete with boys mocking the sweet moment us girls were having! 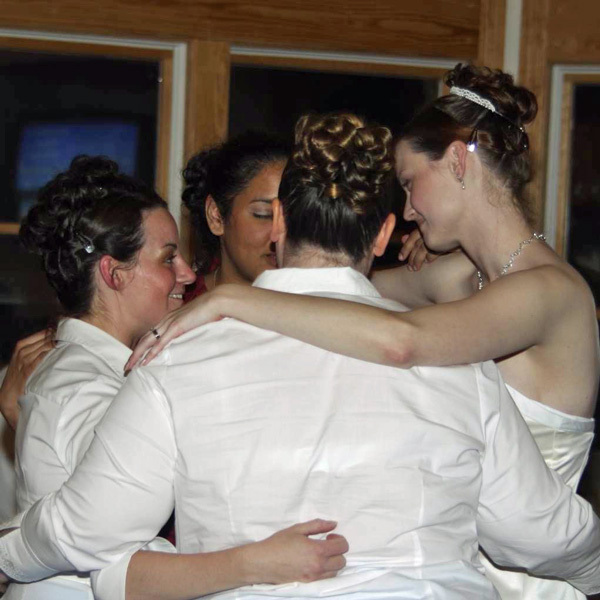 At the reception, we played a mix of songs my hubby put together on CD. Our SIL’s husband served as MC and DJ for the evening. The most popular songs of the night were all Latin music. 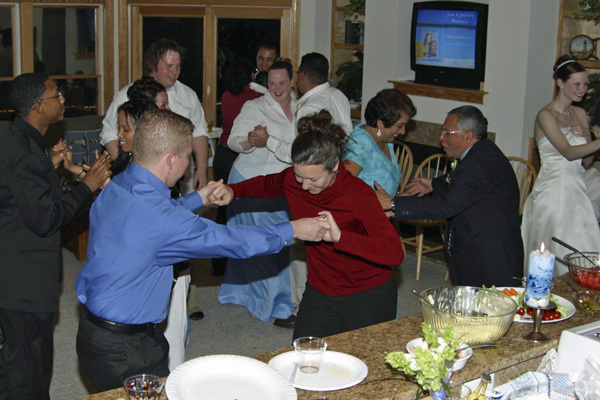 My FIL, MIL, SIL, BIL, and some of our guests spread there Latin rhythm and taught the rest of us how to dance. It was unplanned and so much fun! 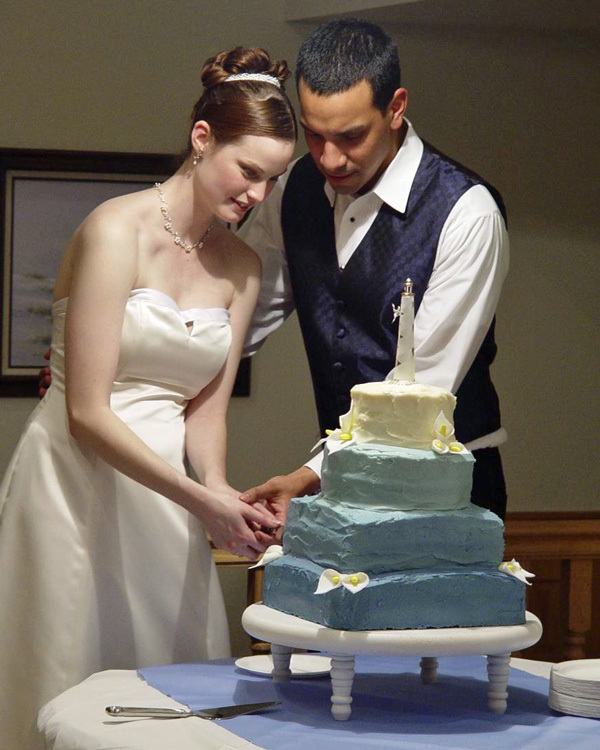 When it was finally time to cut the cake…late into the night, we set out to lovingly feed each other. But, it quickly turned ugly! I think I won. At least it tasted good. So good in fact, everyone staying at the house ate cake leftovers in the morning! We also froze the top white layer and shared it on our one year anniversary…still yummy! It was a week, a day, an evening I will never forget. We are so grateful to this day that we went the DIY route, paid for everything in cash, and had our dream intimate family-style wedding. 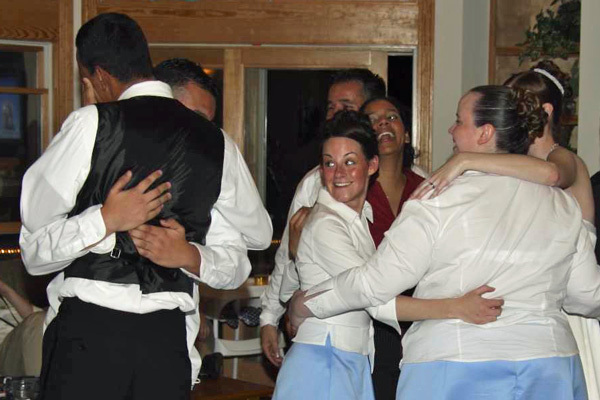 Guests remarked how they hoped their son or daughter might have a similar wedding. Our family still speaks fondly of our wedding today. 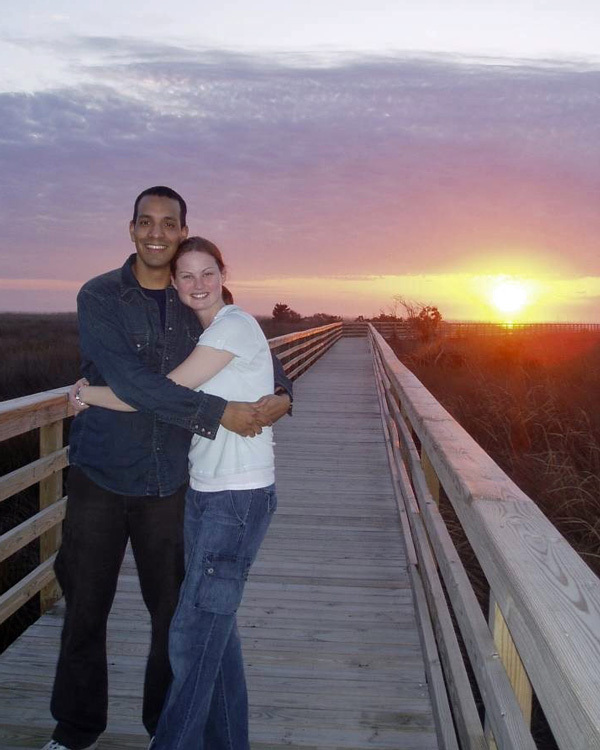 We hope to return to OBX (Outerbanks) for a visit on our 10th wedding anniversary. P.S. I can’t share this story, without sharing one last picture. In loving memory of Mirax, my SIL’s miniature husky. 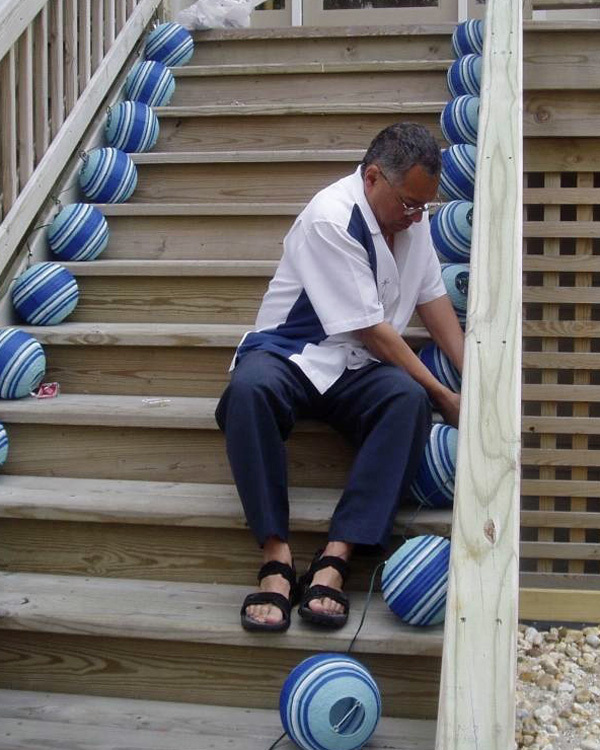 Tragically, he squeezed through the rails on the fourth floor deck of the beach house and fell into the pool. His passing was the one somber event of our wedding week. That is one of the most beautiful wedding stories ever!! I was getting exhausted reading how much you did for your own wedding, especially the day before and the day of!! You are awesome and I wish you and your husband many, many years of happiness…it sounds like you desevre it! What a beautiful wedding you had!! Thank you for the sweet comment. We did do a lot, but you know what…there was a lot we didn’t do. I can’t remember who, but somewhere along the way someone wise told me that only I know the grand plan. If anything was missing the day of, only I would know. They were so right! I had so many other ideas for decorating the house for the reception, but during the busy week we let them go in favor of having fun. In the end no one else knew and I didn’t miss those undone projects. Oh my, Jackie! I was def tearing up a bit reading through your post. Both because of how sweet and intimate your wedding day was, but also because it’s nearly exactly what Bill and I want to do some day. 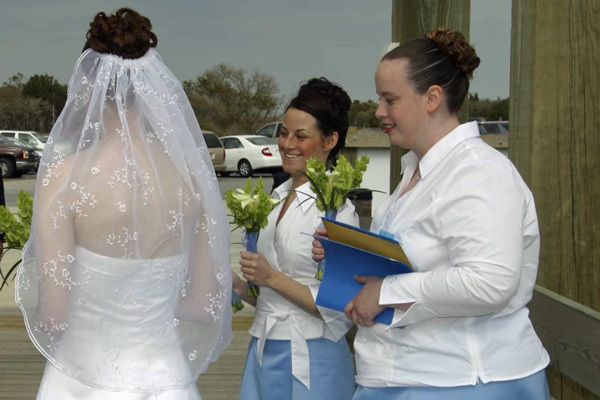 Buxton, NC is basically heaven on earth to us and to be able to bring our families together there to share in our big day — we can’t think of a better place. For your flowers – did you have them delivered to the realtor’s office you rented the house from? And when did you have them delivered? Day before? few days? Beth, Thank you. 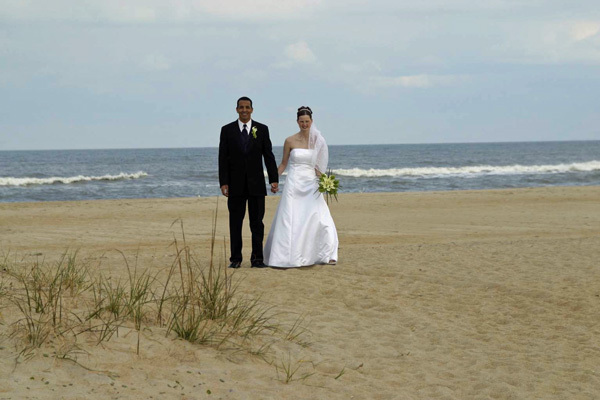 I hope you can have your dream OBX wedding soon. We actually had the flowers delivered a few days early to our house in Hampton, Virginia. Mid-week my hubby had to go back to Norfolk airport to pick up one of the groomsmen. He used the trip to pick up his tux and the flowers, too. If you could arrange to have them delivered to the reality office, that would be genius! I never thought of that. 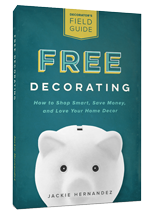 I was sooo inspired by reading about your DIY wedding! Although we have two sons, we do have one daughter who we will have to provide a wedding for some day. 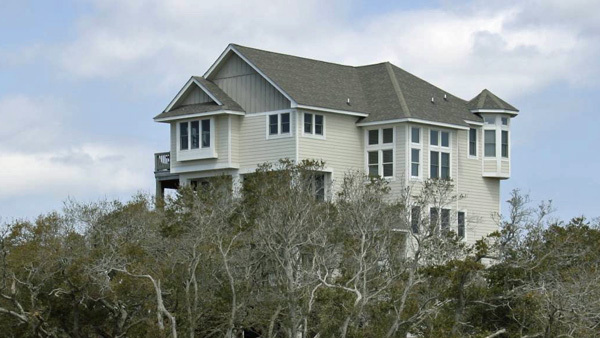 I really love the idea of renting a beach house for everyone. What a wonderful beginning to your marriage! Both families getting to know each other in an intimate setting. Wow! What a beautiful wedding and what great advice about only you know the grand plan you commented above. What a beautiful story! We have been married 10 years now and I sometimes regret that we did the church/reception hall thing instead of something more intimate. Such beautiful pictures, and I can’t believe you made everything from the dress to the cake! Happy anniversary! What a beautiful event. I love how involved your whole family was. The part about your father going to store to buy all the lemon products was priceless. Happy Anniversary to you both. Thanks Lisa. I was so thankful Dad was there to save the day and keep the bride from freaking out. Beautiful story. It brought tears to my eyes. You guys did a wonderful DIY job. Happy Anniversary! It brought tears to my eyes too. And also how proud I am of both of you –how honored–that you gave up time in your lives to keep my freedoms and help others obtain theirs. Truly what a blessing you’ve been to our country. And that you learned to be frugal and yet elegant. For a paid for wedding that has beauty and fun interspersed. Very lovely. This brought back such great memories of that week! It was such a special time, and I am so happy I was there to share it with you! You have always been such a creative person, and you really did an amazing job planning and executing all the details of that day. Happy Anniversary to the two of you! Thanks Aimee! Isn’t it crazy to see the pictures again? It was fun to go through them all an touch them up to share again. Talk to you soon! Such a handsome couple! :) Glad that you shared this with us! 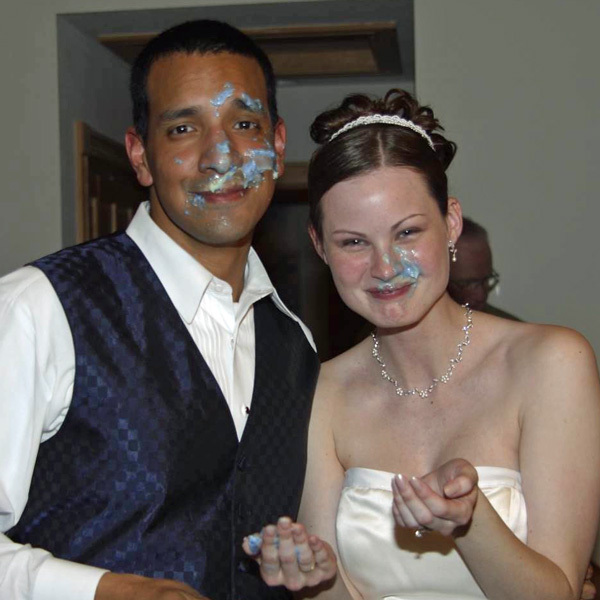 I can’t believe that you were baking your wedding cake the morning of the wedding – I would have been a complete wreck! Happy Anniversary & congrats, Jackie! 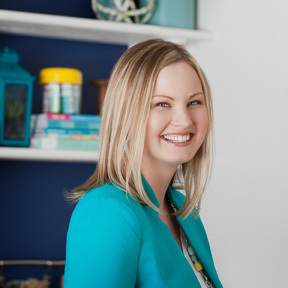 We have some things in common: windy April weddings on the beach in Coastal NC (Emerald Isle, for us) Though I did not DIY near as much as you did! Thank you both for your service! Ah, thanks Susan. This was such an amazing day for us. Can’t believe we just celebrated our 10 year anniversary last month. Wow! What a gorgeous wedding. I got tired just reading all the DIY projects. You are amazing and talented to be able to pull all that off. Including making your own wedding cake the day of the wedding. I have been sewing my own clothes since I was a teenager and there is no way I even thought of trying to make my own wedding dress. Yours was beautiful, elegantly simple. Julie, Thank you. I am not sure I would have had the guts to do it either, if my mom hadn’t gotten the satin at an employee discount and my fiancé hadn’t been deployed for months leading up to the wedding. It was how I passed my time. I muslin sample was key too :) Thank you for the sweet comment.